What Kind of Nests Do Crows Make? Crows and their cousins in the corvid family -- jays, magpies and ravens -- aren't merely bright: They're among the smartest creatures in the world. In fact, some scientists believe that, in intelligence, crows are on the same level as dolphins and primates, with brains that function much like those of people in many ways. It's easy to see evidence of smart thinking in the way these jet-black geniuses construct their nests and protect their young. Abundant almost everywhere in North America, crows start building their nests as early as March in warmer climate zones and as late as mid-July in colder ones. A few weeks before that, the family group, which may consist of two to nine related birds, returns to its usual nesting territory to scout out locations. They look for well-concealed spots that offer shelter from predators and inclement weather, but they never choose the same nesting site as their previous year's. The crotch of a tall tree 15 to 60 feet off the ground would be the ideal choice but when that isn't available, utility poles, window ledges and shrubbery often present viable alternatives. Crows go to great lengths to construct nests that are sturdy on the outside and soft on the inside so nothing pricks the tender skin of their hatchlings. In a completed nest, substances of human origin such as fabric, string, hair, wood shavings and bits of plastic might co-exist with natural substances such as bark, moss and plant fibers. For the outer layer, crows break twigs directly off trees. On average, a crow's nest is about 9 inches high and 2 feet in diameter, with a soft inner cup where eggs are laid and incubated by the mother. The babies are cared for in this nursery until they're strong enough to fly on their own. Everything crows do during nesting season is designed to keep their eggs and chicks safe from detection by predators. When crows build nests in trees, they conceal them so carefully that you might not see them at all until the leaves fall. For another measure of protection, crows build decoy nests. Presumably, if a hungry hawk, owl or raccoon has his heart set on a crow chick dinner but finds the nest he has targeted empty, he might figure that he's wasted enough time in pursuit of that particular menu item and direct his efforts to easier prey. Usually, crows are very noisy birds, but for the time they're building their nests and laying and incubating their eggs, they fall silent, not wanting to give away their presence to their enemies. During nesting season, crow families work cooperatively to help secure the future of the next generation before and after the eggs hatch. Everyone pitches in to help collect nesting materials and construct the nest, which takes about 12 days. 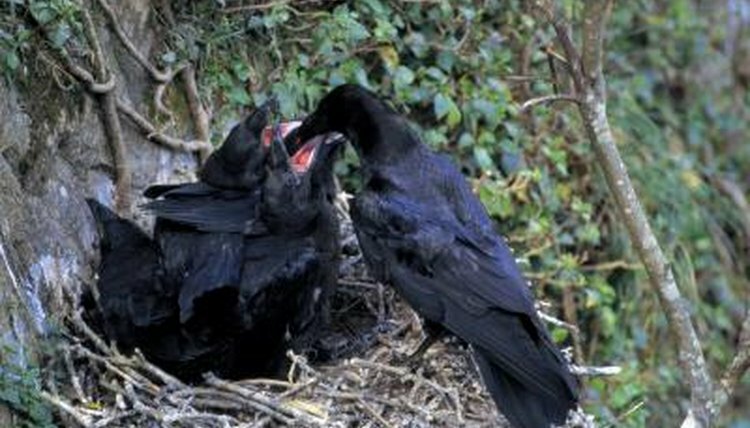 After the mother lays four to seven eggs, she has to sit on them for up to 18 days; during that time, the father and other family members, usually her offspring from the previous year, bring her food. When the chicks emerge, their older siblings help feed them and chase away predators. About 30 to 38 days after they hatch, rapidly growing crow nestlings start thinking about escaping from a nest that has become too crowded for comfort. For chicks whose flight feathers haven't finished developing, leaving the security of the nursery can be a risky venture. The strongest might take to the air on their first try; some may fall and have to spend a few days trying to gather their strength on the ground. Even then, their family members don't give up on them; they'll continue to bring them food and try to keep them safe. That's why well-meaning people shouldn't assume that baby crows they see on the ground have been abandoned and need to be rescued. Chances are they're already being well taken care of.